Request a free party quote today! Looking for an indoor Birthday Party place for your child? Request your free quote today. 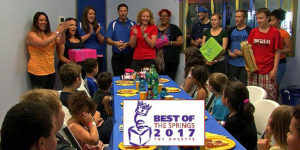 Springs Trampoline Park has the BEST kids party’s in Colorado Springs. Kids love to jump, bounce, and play on all the fun attractions at Springs Trampoline Park. The main court is indoor fun for kids of all ages with over 40 different trampolines connected together. In addition there are sport courts where children can practice their basketball skills or duck, dive, and dodge in a friendly game of doge ball. Springs Trampoline Park is a family friendly indoor play center for children of all ages. The party packages can be all inclusive with a Full Service Package or DIY Party room rental. The Full service Party Packages are themed with blue table cloths, yellow plates, napkins, forks, and cups. Everything is provided for your best birthday party with a full service package. Want to have the best Birthday party in Colorado Springs? Check out these Top Three tips. Our hassle free parties for kids allow you as a parent to enjoy party by being present in the activities. The highly trained Party host will take care of everything you need for the Birthday party. You can focus on capturing your child’s smiles as he/she enjoys the party. For smaller parties check out the Rates and Specials for the 10 or less participants.